The Cone Beam Scanner is an elite imaging technology that provides your dentist in Harrisburg with a comprehensive insight into your oral health. Not only does it show your teeth, but your jawbone, tissues, and other oral structures. The 3D images are of the highest detail, providing your dentist with a crystal-clear picture of all areas on your mouth and oral cavities. With this capability, you benefit from a more successful implant placement to promote the long-term results of the surgery. How Can the Scanner Help Me? Throughout all stages of your treatment plan, the scanner provides a high level of insight into your oral health while highlighting the necessary information to successfully place your implant posts. The success of dental implants relies on your jawbone’s ability to fuse to the implant posts. The scanner can help to ensure that you are a candidate for the procedure by providing your dentist with key information regarding the density of the bone, as well as detect areas of concern, like an infection. This will help to determine if you need additional procedures prior to the placement of your posts, such as bone grafting or periodontal therapy. To ensure that your jawbone can properly fuse to the posts, they must be placed in the right location. The scanner takes the guesswork out of the process to pinpoint the precise area to place the posts. 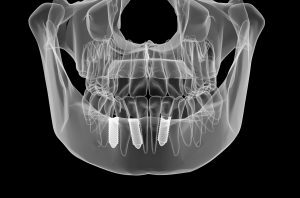 This reduces any room for error or possible implant failure by ensuring that the area they are placed can support them. Even after your implant posts have been placed, the scanner continues to play a valuable role in your oral health. The 3D images will allow your dentist to monitor you through the healing process to ensure that your posts are fusing with your jawbone correctly. It can detect even the slightest variations in your jawbone and the supporting structures to detect potential concerns early to provide prompt intervention. If you are ready to invest in your smile with dental implants, choose a dentist who embraces the latest technology to promote the success of your procedure. Dr. Gary M. Klein offered his dental services internationally before settling in the Harrisburg area. Supported by extensive experience and qualifications, he offers advanced treatments, including dental implants. He combines his training with the latest technological developments to deliver superior care. If you are interested in dental implants, benefit from the best. Contact our office today to schedule your consultation.